VEGREVILLE, AB, May 9, 2018 /CNW/ – TerraVest Industries Inc., formerly TerraVest Capital Inc, (TSX: TVK) (“TerraVest” or the “Company”) announces its results for the second quarter ended March 31, 2018. The Company’s financial results for the second quarter of fiscal 2018 represent an improvement over the second quarter of fiscal 2017. Management believes that there are certain non IFRS financial measures that can be used to assist shareholders in determining the performance of the Company. 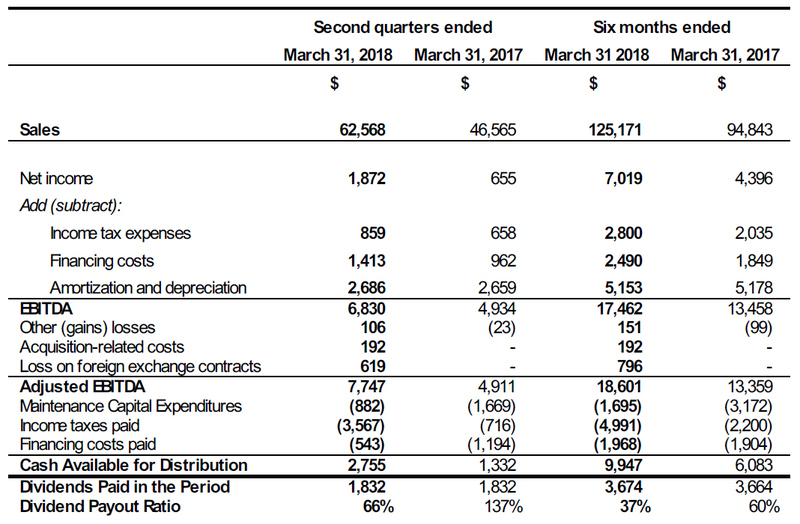 The table below highlights certain financial results and reconciles net income to EBITDA, EBITDA to Adjusted EBITDA and Adjusted EBITDA to Cash Available for Distribution for the second quarter and the first six months ended March 31, 2018 and the comparative periods in fiscal 2017. Sales for the quarter was $62,568 compared to $46,565 for the prior comparable period representing an increase of 34%. This increase primarily results from the additions of MaXfield Group Inc. (“MaXfield”) and Fischer Tanks LLC (“Fischer Tanks”), which did not contribute in the prior comparable period, as well as increased demand for most of Fuel Containment’s product lines. This was partially offset by reduced output in one of Processing Equipment’s subsidiaries as a result of moving into a new manufacturing facility during the period. Adjusted EBITDA for the quarter was $7,747, which represents an increase of 58% versus the prior comparable quarter. This increase is a result of the reasons highlighted above, including positive contributions from MaXfield and Fischer Tanks, partially offset by the impact of moving into the new facility in Processing Equipment. Maintenance Capital Expenditures were $882 for the quarter versus $1,669 for the prior comparable period. This reduction is largely due to timing of required capital projects, which can vary significantly from quarter to quarter. During the period, the Company’s total purchases of property, plant and equipment were $3,768 of which $2,886 is considered growth capital. This growth capital includes additions to the Company’s desanding equipment rental fleet, equipment for a new domestic propane tank manufacturing line, as well as equipment to support a new manufacturing facility in the Processing Equipment’s segment. Cash Available for Distribution increased 107% over the prior comparable period. This increase is due to better operating results (explained above) and reduced Maintenance Capital Expenditures, which were partially offset by increased Financing costs, as debt levels increased to support the acquisitions of Fischer Tanks LLC and MaXfield Group Inc. The Fuel Containment segment continues to experience increased levels of demand this year for its products and management continues to expect fiscal 2018 to be a stronger year than prior. Output during the quarter for certain propane storage products was negatively impacted due to weather in Northeastern United States and Canada, but this impact is only temporary as backlogs remain strong. Global steel prices continue to be a challenge as a result of dramatic price increases and supply shortages for certain products. Management continues to expect that fiscal 2018 will also be a stronger year than fiscal 2017 for the Processing Equipment segment. Backlogs remain higher than the previous year and management is expecting positive contributions from the recent acquisition of MaXfield Group Inc. There continues to be a divergence between oil and natural gas pricing which is having a varying effect on this segment’s customer base. Pricing pressure continues to be an issue for this segment, in particular for its oil and gas processing equipment product lines, and is expected to continue as long as there remains excess manufacturing capacity in Western Canada. The outlook for the Service segment is not materially different than the prior year. Pricing pressure has been major challenge for this segment. Management is optimistic that the increase in oil prices will bring higher rates for its service rigs, as many of this segment’s customers are oil producers. However, increasing operating expenses and labour challenges could mitigate the benefits. TerraVest is also pleased to announce that The Board of Directors has declared its quarterly dividend of 10 cents per Common share payable on July 10, 2018 to shareholders of record as at the close of business on June 29, 2018. The ex-dividend date is June 27, 2018. The dividend is designated an “eligible dividend” for Canadian income tax purposes.